History in RGB, Maria Dumlao's current show at Vox Populi, contrasts sharply with my prior experience of her craft -- 2014's soothing, trancelike Expanded Earthly World. Since then, Dumlao has traded in the trancelike for the alarming. The feeling upon entering History in RGB is that of walking into some kind of glitch; the violently-bright color posters hanging on the walls combine with the arrangement of plants in the center, faintly simmering under red, green, and blue lights, to invoke a state of heightened anxiety. Aside from ocular discomfort, there are several kinds of intellectual tension at play in this work -- the struggle between history and myth-making, the struggle over the role of photography as a truth-telling medium, and, as it turns out, a struggle between the viewer of History in RGB and the work itself. 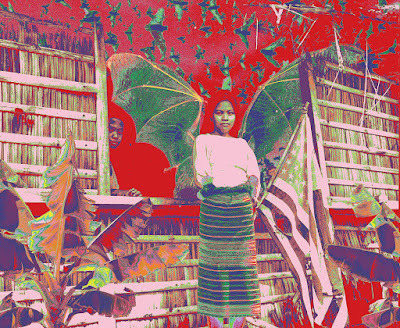 “An Ally, Isang Alay, at Manananggal (RG)”, 44” x 53”, archival pigment print. Image courtesy of Maria Dumlao. Dumlao describes History in RGB as follows: "Each print is a juxtaposition of images that have been stripped of color, then re-assigned with the value of a specific color based on a 'tropical' Pantone palette. The re-assignment of color is based on the value system set by red, green or blue." The quality of the posters themselves is outstanding; there's no blurriness or disintegration of the clarity of the images, no matter how closely you looks. At a distance, however, the cacophony of colors Dumlao has amassed is disorienting, requiring true effort on the part of the viewer to (re-)establish order. Once you do manage to reconstruct the sense of a grove of trees here, a sandy beach there, you realize that a number of these images aren't merely photographs, but collages -- which makes all the difference. Integrated within the photographs are what look like engravings of the kinds of fantasies that served as the West's imaginary "Orient." An image depicting a thick forest combines photography (the larger forest vista) and illustration (a pasted snippet of a snake coiled around a tree branch, with two soldiers approaching from behind). The illustration fits into the photograph almost seamlessly, keenly reminding us that sometimes it is hard to distinguish the fantasy from the reality, if the fantasy is what appeals to us. In another poster, Dumlao has pasted in a reproduction of a group of European soldiers fighting a band of exoticized archetypal "natives," recalling sixteenth- and seventeenth-century illustrations of the Conquistadors conquering South America. And as you look deeply at Dumlao's other posters, you get echoes and reflections of the same dynamic played out through time--that of Western conquest and colonization, of Europeans (and eventually Americans) attempting to "civilize," mold, and control the "other." 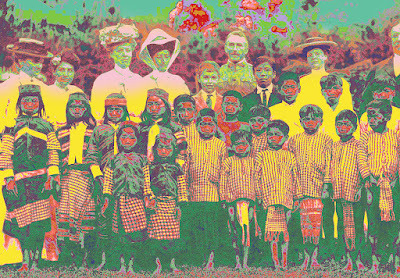 “Native children, Thomasites, Mayon Volcano, and Kapre (RG)”, 44” x 61”, archival pigment print. Image courtesy of Maria Dumlao. Across from the Conquistadors is a photograph likely dating from the late nineteenth or early twentieth century of a stilted, almost sulky group of Southeast Asian schoolchildren with formally-dressed white adults smiling behind them. The contrast between the two groups of people is remarkable--while the children appear withdrawn and evidently unhappy, the adults standing over them appear oblivious to the harm they've caused, looking for all the world as if they're about to crow over their success at educating and Westernizing these children. This photograph epitomizes how competing narratives often coexist within the same historical moment. The thread is then picked up in a photographic poster of more modernly-dressed soldiers with rifles. Creeping among the soldiers are inserted snakes and crocodiles, seemingly escaping right under the human protagonists' noses. 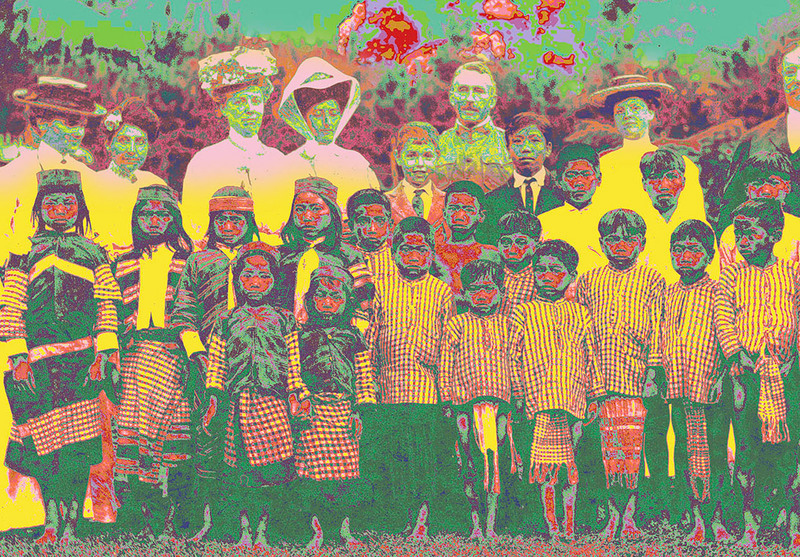 “As the first of these men came up the bank the Filipinos bolted (RG)”, 44” x 111”, archival pigment print. Image courtesy of Maria Dumlao. What Dumlao has presented, ultimately, is imagery that exists on a sliding scale of truth. In a formal sense, these photographs of colonial settings have been literally reinterpreted and refracted through a Western lens (Pantone is an American company). At the same time, the installation reminds us that, when it comes to how we talk about history, it's important to know what has been distorted, inserted, and altered. Dumlao, who was born in the Philippines, shows that the process of unlearning is visceral, painful, and necessary. In a sense, the unreal nature of History in RGB's visuals functions like a science fiction allegory or dystopian story. These environments are clearly based on real-life situations that occur (or have occurred) in human history, but because they might take place in a fictionalized setting, we don't recognize that we're looking at ourselves, at our own histories, just shown through a different lens.